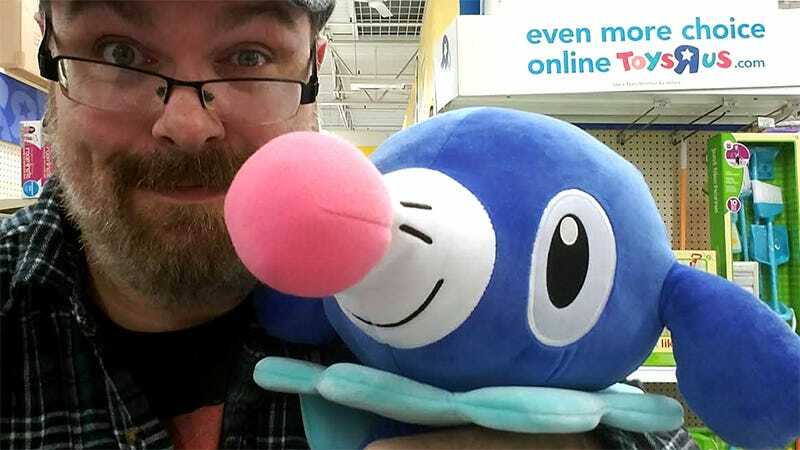 I offer a picture of me during happier times, before my new best friend Popplio and I took a trip to the Toys’R’Us price scanner. We first met at the toy store on Saturday evening, as I was hunting for Christmas gifts that could survive more than an hour of play with two five-year-olds without being reduced to their component elements. Sweaty, tired and cranky from trying to dodge the professional-level aisle blockers that flock to Toys’R’Us during the holiday rush, I paused for a breather in the no man’s land between arts and crafts and fashion dolls. There, resting on a display of what looked like child-sized brooms and dust pans, I found Popplio. Sometimes we even look alike. What a crazy pair. Popplio was my starter choice in Pokémon Moon, and while it was a pretty easy choice, I did feel bad about passing up the other two options. So, when I got to the Pokémon/Yo-Kai Watch/Confused Parents aisle of Toys’R’Us, I was overjoyed to discover Litten and Rowlet waiting for me. This was no game. This was real life, and in real life I don’t have to choose. Me and my posse, rolling true blue through TRU. We have a lot of fun here on Grown Man With Plushies, but let’s take a moment to talk about something that’s not fun—hitting the price scanner at the end of the aisle and realizing the cost of stuffed Pokémon. These particular plushies, a product of the official Pokémon Center, retail for nearly $80 apiece. At first I thought the figure might be a result of the standard Toys’R’Us up-charge (dedicated toy retailing space isn’t cheap), but then I found Popplio on Amazon for around the same price. Damn. Picking up all three was definitely out of the question, but what about my OPP (Original Pokémon Plushie, though for you it might mean something different)? I had a choice to make. Buy Popplio for $80 and be happy for the rest of my life, or leave my Water Fairy friend at the price checking altar in favor of getting more/better/sturdier Christmas presents for my wife and kids. That is to say, I had no real choice. So I left Popplio, Rowlet and Litten in the Toys’R’Us aisle. I made sure they were all cuddled up close to each other for warmth. I imagine they’ll be picked up by adoring children over and over again during the coming weeks, hugged tight, clung to and loved, at least until their parents get to the price checker machine. Some people I’ve shown these images to say that Popplio, Rowlet and Litten are sturdy, high-quality plushies that are well worth the asking price, and I don’t disagree. I just wish I’d known the cost before I gave Popplio my heart. Seriously, Toys’R’Us, mark your damn shelves.